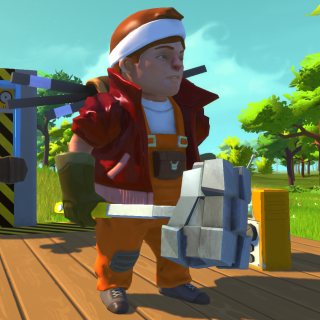 Scrap Mechanic is what I imagine would happen if you crossed Minecraft with Warcraft's goblin engineering. Scheduled to hit Early Access on January 20, it's survival with the twist of having technology on your side, if not the sense to use it without some serious health and safety violations. The usual voxel-placing is accompanied by the ability to power and animate whatever you create, and that includes your front porch. As someone who finds the most basic redstone circuits taxing, that sounds like a lot of work, but in its latest progress video, Axolot Games has unveiled the Controller: a neat little gadget to set up transformations that make Optimus Prime look like so much Lego Technic. Each Controller can perform up to ten actions in sequence for ten bearings connected to it. Actions are synchronised between bearings, so you can order a steel bar to retract on step one before a door swings open on step two, perhaps sliding into the floor on the third beat for good measure. It's about as close to intuitive as synchronous virtual circuitry is likely to get—the footage at 4:42 provoked serious upward eyebrow-movement. Based on my own incompetence, I have to wonder how many people will have the patience to successfully transform their house into a roving battlestation, but if you're frustrated with Minecraft's lack of roving battlestations, Scrap Mechanic ought to be on your watchlist.